Time for an update? You've come to the right place! Click here if you're looking for WiFi Enabled Ethernet Power Controllers or Web Power Switch Pro Firmware. * some DC powered products may have firmware updates locked-out with an internal wire to prevent FLASH corruption at low operating temperatures and under brown-out conditions. then go here for firmware updates. Firmware should be updated only when a local connection is available. Firmware update over LAN/WAN is highly discouraged. Interrupting the update process can corrupt the firmware image, necessitating mail-in factory service. A direct connection is recommended. Once the update process is started, it must not be interrupted for any reason, or damage to the switch could occur. If you have enabled the PROTECT feature, you will need to physically press the reset-to-defaults switch before updating. The power controller contains both EEPROM and FLASH. EEPROM is used to store outlet states, outlet names, user logins and scripts. In most cases, EEPROM content will be unaffected by an update. If you are updating from a very old code version (before 1.2.3 circa 2010), a ~60s delay may occur while EEPROM is reformatted. Please wait for reboot. Power to outlets may be cycled on older products. Some new features such as LCD control, serial ports, scripting require that the appropriate hardware and expanded memory be installed in your unit. Disconnect any AC loads before proceeding. Disable AutoPing and scripting. 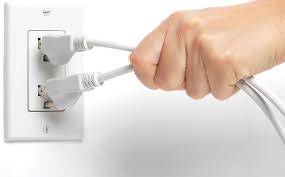 Updates may cause changes in outlet or port states (on, off or cycling)! 2. Login. Check rev. Download. 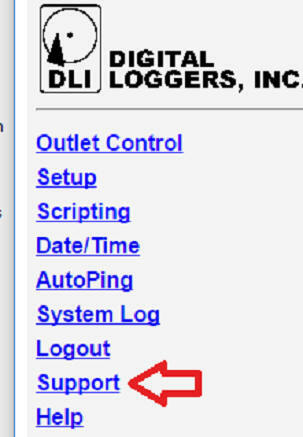 Log in to the power switch as admin. Your current firmware version is displayed in the lower left hand corner of the outlet control page. Check the revision history here. Really need an update? Download 1.8.6 here. Unzip. Confirm you have a -DIRECT LOCAL- Ethernet connection. Enter this URL (using your actual IP). Select the .BIN file and be sure not to interrupt the process. Learn more about scripting updates here, Wake on LAN, SYSLOG and AutoPing here. Thanks for choosing DLI. We'll work hard to earn your business!